This design took a full six months to complete, and although the main colour scheme is an autumnal black and orange, it uses over 70 colours and shades, including bronze and silver metallic pigment, mica, embossing and 23.5 carat gold leaf, as well as many areas of detailed bokashi, or hand-shading, to give for example a softness to the background and the waves of the girl's hair. 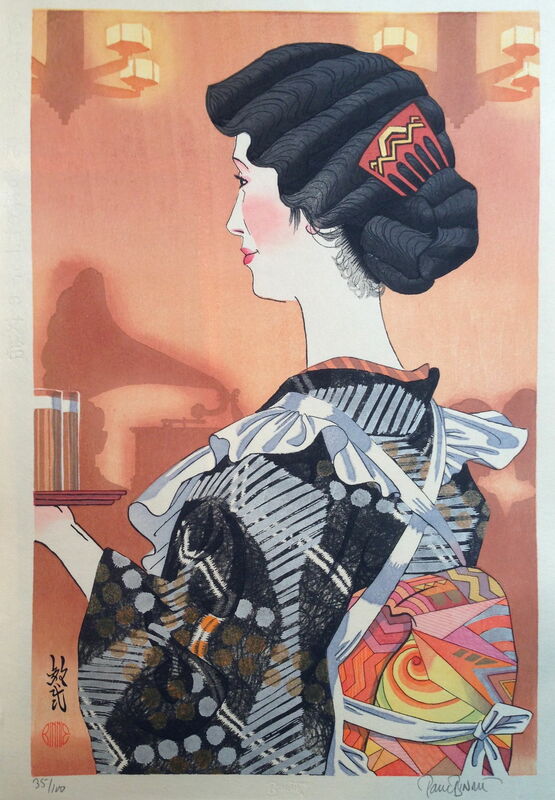 The café became an important cultural site in inter-war Japan, and as well as providing employment and thus independent income for women, it was a place frequented by the writers and thinkers of the Taisho and early Showa Periods. Waitresses became one of the main attractions of the many cafés which spread throughout Japan, and poetry, novels and popular songs were dedicated to them. I decided to show this particular beauty in profil perdu, turning slightly away from the viewer, so we can see she has not cut her hair but left it long, as many did, and styled it with deep Marcel Waves, a very popular style of the time. Her obi is the most elaborate I have ever printed and uses over 30 colours including bronze, silver and deep embossing, many of which appear no-where else in the print but only as a small detail in the obi. This obi and her kimono too are based on authentic Japanese Art Deco designs, as are the silhouettes of the gramophone and chandeliers in the background, which come from an Imperial palace. The black kimono - printed with dense black baren sujizuri, or swirly line printing - features a unique translucent orange mica overlay of dots to add to the many oranges in the piece. Her hair comb is lacquered with a design of a gilded Mount Fuji amongst its foothills, derived from another Japanese Deco object in lacquer, anticipating the near-obsession artists and designers would have with this mountain during the nationalistic 1930s and the war years which followed.